1. John, Julia, and I explore The Yards as a potential Friday evening hangout for the rest of the summer. With its wading pool (where we spend the night with our feet in the water), riverside location, and expansive green, I think we may have found an ideal spot to listen to some music. 2. A jogger passes me, iPod in hand. Her movements are a little jerky and when she gets caught at the light, it becomes apparent she’s dancing along to the music. She looks exactly as goofy as you feel when you’re the only one moving to music, but so joyful that I resolve to squelch the evil internal fairy who tells me to stop dancing on Metro platforms. 3. Sunday’s farmers’ market offers up the first raspberries, plums, and corn of the season. That night we feast on corn on the cob drenched in butter and salt, a perfect summery complement to the guacamole Rudi makes. I’m not sure about pairing this Jonathan Coulton song with the Companion from Dr. Who, but I really like the song and this was the only way to show it to you in its entirety. But someone should really consider pulling clips from one of the versions of Pippi Longstocking, since she seems a more appropriate match to the lyrics. Category: arts. There is/are Comments Off on music on monday: the princess who saved herself. 1. Rudi and I have tickets to see The Merchant of Venice at D.C.’s Shakespeare Theatre tonight. (Yay, Groupon!) We decide to have dinner before the show, and a gift card my brother gave us for Christmas a number of years ago comes in handy in narrowing down our choices. We dine al fresco along Pennsylvania Avenue, listening to the carillon concert from the Old Post Office Tower, and enjoying drinks and a delicious three-course meal. And then we walk out without having to leave even a dime of our own money. 2. A swarm of nasty biting critters descends on me at the garden Sunday, chewing up my arms in a spectacular fashion. The next day, unable to find the only commercial remedy that seems to help (After Bite) and driven to madness by the itchiness and swelling, I resort to Mum’s remedy from my childhood — a baking soda paste. It’s crumbly and messy (I’m glad I thought to put down a towel before applying it generously to my arms and legs), but the relief is nearly instantaneous. 3. The final two episodes of this season of Bones leave me in a melancholy mood. After Rudi goes to bed, I rummage through the fridge and settle on the first blueberries of the season. I curl up on the couch and pop them in my mouth one after another, just like M&Ms, but healthy. How about you? What was beautiful in your world this week? Category: three beautiful things. There is/are Comments Off on free, relief, and popping ‘pills’. My take: Thursday Next — oh, no, not that one; the written one, but a darn good facsimile — has enough on her plate. She’s training a new understudy. She’s trying to avoid the advances of a fellow BookWorld resident who may not turn out to be the nice guy he seems to be. She’s working hard to keep the peace amongst her fellow cast members, who are all upset with her because the previous written Thursday ran a much looser, more fun ship. But while this Thursday was asked by the real Thursday to try to make their story more respectable, it also has meant that the books are duller and, therefore, more at risk of not being read at all — a dangerous fate indeed. So, you see, the written Thursday already has plenty going on. She does not need to be pulled into a coverup. She does not need to be caught between Jurisfiction and the Council of Genres. She does not need to be hunted by the Men in Plaid. She does not need to suddenly be in possession of the real Thursday’s Jurisfiction badge. And she definitely does not need to reach the conclusion that something bad has happened to the real Thursday, just as she is about to serve as an emissary to settle a boundary war between Racy Novel, Dogma, and Women’s Fiction with potential implications across a dozen genres. And, yet, like her namesake, the written Thursday Next does not seem to have a lot of choice about the adventures that fall into her life. If that was hard to follow, it’s because Jasper Fforde is one of the cleverest writers currently working. This is the sixth book in a series about Thursday Next, a woman living in an alternate version of modern-day London, who also happens to be able to transfer inside of books in the same way you or I might take a trip to Disney World. Jasper Fforde makes your head explode, but in a nice way, and then puts it back together again. The Lady of Shalott was of an indeterminate age and might once have been plain before the rigors of artistic interpretation got working on her. This was the annoying side of the Feedback Loop; irrespective of how she had once looked or even wanted to look, she was now a Pre-Raphaelite beauty with long flaxen tresses, flowing white gowns and a silver forehead band. She wasn’t the only one to be physically morphed by reader expectation. Miss Havisham was now elderly whether she liked it or not, and Sherlock Holmes wore a deerstalker and smoked a ridiculously large pipe. The problem wasn’t just confined to the classics. Harry Potter was seriously pissed off that he’d have to spend the rest of his life looking like Daniel Radcliffe. If you’ve never read a Thursday Next novel, start with The Eyre Affair, which sets the story up properly. If you’re already up to speed, I will note that while I liked this book quite a bit, I would have done well to re-read (or at least flip through) the earlier books before beginning this one, because there were some details I was a little fuzzy on when they were referred to in this novel. All in all, though, I thought One of Our Thursdays Is Missing did a good job reinvigorating a series that was in danger of straying too far into pun for its own good. I look forward to the next tale in the adventures of Thursday Next — both real and written. If you’re a Jasper Fforde fan, you might consider checking out this podcast at Chatting Up a Storm with Claudia Cragg. I haven’t listened yet, but it’s in my queue for the iPod. This was my second book for this spring’s Once upon a Time Challenge. 1. Spring has been slow to arrive in Salt Lake this year, and to its surrounding mountains even more so. We drive up into them for the afternoon and wonder at the wash of velvety yellow-green coats the aspens are wearing as far as the eye can see (at least until you hit the snow line). 2. A sudden afternoon thunderstorm is gone nearly as quickly as it arrives, but in its wake it leaves behind a triple rainbow arcing over the mountains to our east. 3. The pool next to our room opens early and stays open late. We spend an hour paddling around under the watch of a waxing moon. Those are just three of the beautiful things from my world this last week. What’s been beautiful in yours? Rudi and I returned home this morning via a red eye flight and rush hour public transportation and then preceded to squander our last day of vacation and gorgeous weather by sleeping all day. However, we did finish up our week off with a fun, fun, fun Katy Perry concert. 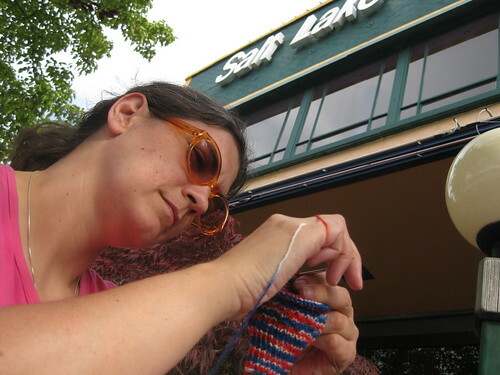 Category: knitting,travel. There is/are Comments Off on home again, home again.